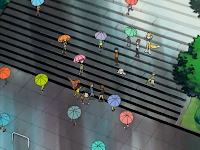 In this episode, the first Tamers ending “My Tomorrow” and plans regarding the rumored Xros Wars dub. Yay for well-timed halftime breaks! The timing of this haltime break is incredibly lucky as I just ran a convention last weekend. Geek.Kon in Madison, Wisc. was a smashing success, but chewed up all of my free time, so attempting to have a new episode this weekend would have probably killed me. On the plus side, there was a Digimon panel and it went very well, despite running out of time and forcing me to wrap them up before they delved into Xros Wars. If you fancy a trip to Wisconsin Dells, I plan on running a Digimon panel at Daisho Con in November. Speaking of Xros Wars, there have been a few reports that a dub is currently in the works. For the sake of consistency, if it debuts before we hit Xros Wars in our schedule, that's what we're rolling with. If there is concrete news that a dub will be released during or after we hit Xros Wars (or Hunters), we will delay posting in order to follow the dub (assuming it's televised, because we all hope it will be). I'll make sure to watch the Japanese version during this delay in order to have some idea what we're dealing with. On the other end, Digimon Adventure is scheduled for an official American release in awesome box set format. Everybody should buy it to reward the company doing this... and so they do the same for the other seasons. 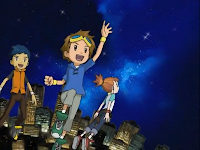 On the upper right of this site is a link to pre-order the series (or buy any other Digimon goodies) through Amazon. I encourage you to use the link for that or any other Amazon shopping as I get a cut of any purchases and it would be a great way to show support for this project. That's a lot of Takato angst for such a cheery song. Since this is Tamers, the problem is probably that it's too cheerful. But hey, there's proper animation now so who's complaining? I hear they're also making a game directly based on Adventure. The game is pretty awesome, even though its only in Japanese and for the PSP. It does change a few things but its still great and nostalgic. Would defnitely recommend for anyone who is a Digimon Adventure(or Digimon fan in general) fan. Rika's last name are two actual Japanese words put together? Cos in the song, there's a phrase at 0:21 'no naka'.